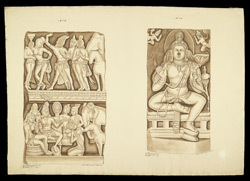 Wash drawing by Murugesa Moodaliar of a carved drum slab and a Bodhisattva sculpture from the Great Stupa of Amaravati. This is one of 42 sheets (89 drawings) depicting sculpture from Amaravati and S. India. Inscribed with numbers 2 to 90 (1 is missing) and with measurements; signed:' P. Mooroogasa Moodr', dated c.1853. The drawing No.2 depicts a drum slab carved in high relief in two registers. The lower register depicts a figure of Cakravartin or Universal King seated on a throne surrounded by servants. In the uper register the Cakravartin is depicted raising his right hand to strike his left fist to produce a shower of coins which can be noticed carved on the background. The king is flanked by two female figures on his right while on his left stand two males next to an elephant and a horse, both symbols of the Cakravartin. The relief has been assigned to the first phase of the highest period of sculptural activity at Amaravati, the 2nd century AD. The drawing No.3 depicts the Bodhisattva Manjusri seated on a low throne with his right hand in abhaya mudra (protection gesture) and his left hand holding a lotus. This sculpture has been assigned to a later period of sculptural activity at Amaravati, c.8th century AD.